With one of the UK and Ireland's most experienced flying instructors, affordable costs and a fantastic aeroplane, we will have you finding your wings before you know it. Book a lesson today, and begin your adventure . A fully CAA certified instructor with over 17 years instructing experience. 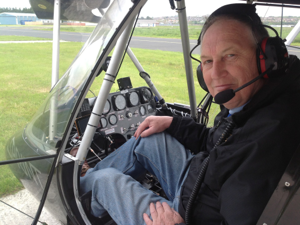 Ken has also 40 years of flying under his belt, so you know you're in safe hands! Book a Fixed Wing lesson or trial voucher today using the form below, or contact us to arrange a lesson. Conditions are not ideal, call before travelling to the airfield. Reece Griffith is a second year Aeronautical Engineering Student at Queens University Belfast and has an academic interest in the theory of flight. Putting theory into practice is not normally as easy as it looks but in this case it certainly was as it only took Reece just over 6 hours from his first flying lesson in Thruster G CGFZ to his first Solo flight on 3rd January 2019. Congratulations Reece on a very competent First Solo. Sean Scullion officially became 16 at midnight on 4th December 2018 and by 10am that day had submitted his CAA Self Declaration Medical and flown his First Solo in Thruster G CGFZ. As sunrise that day was at 0826 Sean completed his First Solo flight 2 hours and 4 minutes after he was legally allowed to do so. Sean was given permission by his school to take the morning off for his First Solo but must be back behind his desk for his end of term exams tomorrow, so it will be back revision tonight but he may find a few spare minutes to fill in an application for the young person’s BMAA flying bursary. Congratulations Sean. Wings Night this year at the Ulster Flying Club saw five new Microlight Pilots being presented with their Wings Certificates by veteran World War 2 bomber pilot Bill Emes. Clement Buchanan, Roy Clarkson, Edwin Calvin, Bobby Moore and Tom McCrea were also presented with engraved crystal whiskey glasses by the club which they put to use before posing for the obligatory group photo. I hope you’re keeping well! Just wanted to let you know you can add one more to the list of Fast Jet pilots you have trained! Out of 19 students being streamed after elementary flying training, 6 of us were selected for fast jet! I definitely wouldn’t have been in that top 6 without the training you gave me back home, so many thanks once again! Still plenty of work ahead but glad it’s going in the direction I wanted! I don’t start my next stage of training until the summer so going to put my NPPL to good use with the RAF Microlight Association in the meantime! The trial lesson was great fun, flew the entire time, thanks Ken. This school supports the British Microlight Aircraft Association. Click the image to find out more.